Officially known as the Secret Intelligence Service (SIS), MI6 is the chief British foreign intelligence organization, analogous to the United States Central Intelligence Agency. The organization is even more secretive than either its American counterpart, or another well-known member of the British intelligence community, the Security Service, or MI5. Although their functions are quite separate, the MI6 and MI5 share origins, and much of their history in the world wars and Cold War era ran along parallel lines. Yet, whereas MI5 has established a tone of openness with the British public since the early 1990s, MI6 remains guarded concerning the details of its activities. During World War I, MI6 conducted intelligence operations involving both Germany and Russia, and its operatives and agents included both the author W. Somerset Maugham and the legendary spy Sidney Reilly. In 1919, MI6 took charge of the Government Code & Cypher School (GC&CS), formed from the remains of the British Admiralty's Room 40, along with a smaller War Office program. GC&CS soon proved successful at breaking ciphers used by the new Bolshevik government. MI6 efforts against both Russia and Germany in the 1930s uncovered evidence of Nazi-Soviet cooperation in the development of weapons technology, but during this era, MI6 also suffered a number of failures, leaving the British government unprepared for such moves as Hitler's reoccupation of the Rhineland in 1935. World War II and the early Cold War. A new era began for MI6 in November 1939 when, just three months after the outbreak of war, Colonel Stewart Menzies became the new "C." In that same month, MI6 suffered a major setback when the Germans captured two of its officers in Holland, and obtained considerable information from them under interrogation. Yet, MI6 excelled in its cryptanalytic efforts against the Germans through GC&CS, which in 1942 became the Government Communications Headquarters (GCHQ). Operating from Bletchley Park outside London, GCHQ successfully broke German ciphers on the Enigma machine—the single greatest cryptanalytic success of the war. Despite the spirit of wartime cooperation with Josef Stalin's Russia, Menzies in 1944 wisely established a section devoted to Soviet espionage and subversion. Less felicitous was his choice of a section head, Harold (Kim) Philby. In what proved to be a classic case of the fox guarding the chicken coop, Philby would later be exposed as a Soviet spy, and he was not alone; among the many Soviet moles exposed in the two decades after the war were John Cairncross and Charles H. Ellis, both with MI6. Further misfortunes followed as MI6 attempted unsuccessfully to gain intelligence on a Soviet ship docked at Portsmouth, an effort that cost the life of a former navy diver named Lionel Crabb. 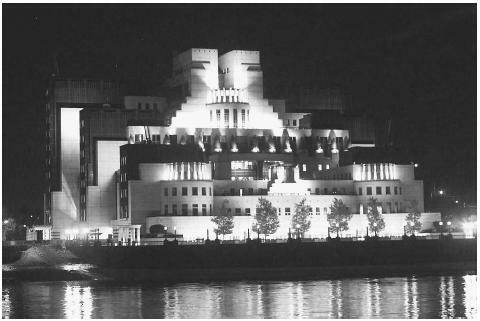 Yet, MI6 was not without successes in the immediate postwar years; it cultivated a relationship with Soviet intelligence officer Oleg Penkovsky, who would prove a valuable asset to both British and U.S. intelligence. From the late Cold War to the present. By the 1970s, MI6 had turned its attention toward a number of areas other than the Soviet bloc. These included economic espionage, as well as efforts against terrorist groups in Northern Ireland. In the latter capacity, the agency found itself in a turf war with MI5, which was already working on the problems in Northern Ireland. MI6 proved an invaluable asset in the conflict, establishing key links with top Irish Republican Army (IRA) and Sinn Fein figures. Unfortunately, MI6 suffered another embarrassment when two brothers claiming to be MI6 operatives conducted a number of bank robberies in Northern Ireland and claimed that they had been directed to assassinate IRA leaders. During the 1980s and 1990s, MI6 recovered its standing through successful operations in the Falklands War, Persian Gulf War, and Balkan wars. It gained new statutory grounding with the 1994 passage of the Intelligence Services Act, which defined its responsibilities and functions, as well as those of its chief. The act also set in place a framework of government oversight for MI6 activities. In 1993, Sir Colin McColl became the first MI6 director to be publicly identified. He was replaced in 1994 by Sir David Spedding, and in 1999, Spedding was replaced by Sir Richard B. Dearlove. The headquarters of the British intelligence services MI6 in London, seen from across the River Thames on the night of September 20, 2000, after an anti-tank rocket was fired at the building. No injuries resulted from the attack, thought to have been perpetrated by the Real IRA. Andrew, Christopher M. Her Majesty's Secret Service: The Making of the British Intelligence Community. New York: Viking, 1986. Dorril, Stephen. MI6: Inside the Cover World of Her Majesty's Secret Intelligence Service. New York: Free Press, 2000. United Kingdom Intelligence Agencies. Federation of American Scientists. < http://www.fas.org/irp/world/uk/index.html > (April 11, 2003).